Contributors and commenters grant Portland Transport a permanent, unlimited, worldwide non-exclusive license to publish and/or relicense their submissions. Opinions in posts and comments are those of the authors, not necessarily those of Portland Transport. Responsibility for those opinions rests with the authors. This site HAS a point of view, generally supportive of transit and compact development, and efforts to reduce VMT (vehicles miles traveled), including as a strategy to reduce greenhouse gas emissions. This is intended to be the general center of the conversation here. While opposing views are welcome, participation that is of a quality or quantity that combines to undermine the purpose of the site may be restricted or refused. Constructive disagreement is welcome, but simply repeating your disagreement is not. If your disagreement is simply to protest our point of view, you should find another outlet for your views. 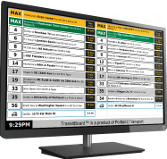 Passion and robust debate about ideas are what Portland Transport is about. Passion directed at individuals is not, and will be deleted promptly. Please confine your remarks to policy, opinion and data. Anything proposing, suggesting, or even hinting at violence is out of bounds. Use of inflammatory words or comparisons (“tyranny”, “fascism”, “communist”, “genocide”, “Hitler”, “un-American”) in the context of discussing transportation or land-use issues, is out of bounds. Transparency is appreciated, but respecting privacy is required. Posting under a real name is preferred. If you prefer to use a pseudonym, please use the same one consistently. If you have an affiliation or other factors that readers might reasonably use to assess your comments, we request that you disclose them, but that’s your choice. However, questioning the motivations or sincerity of participants is prohibited. While you are welcome to disagree, you are not welcome to be disagreeable. Please treat fellow participants with the respect you would give a guest in your home. Comments which are in violation of the terms of service or rules of conversation may be removed in part or in full. Repeated violators may have their ability to comment blocked temporarily or permanently.